sheep and no city: Summer! My appologies go out to everybody, who should have received an answer to a comment, a longer email or an email at all. I am hardly ever connected to the internet at my parent's house and I am going to travel now for another week. Yippieh! However..... I can announce a contest coming soon. Under the above mentioned keywords like Germany and summer and given the fact that this is still meant to be a blog about knitting, those who assume the contest might have something to do with just these keywords, summer, yarn or Germany might be right. Please come back for more details later. 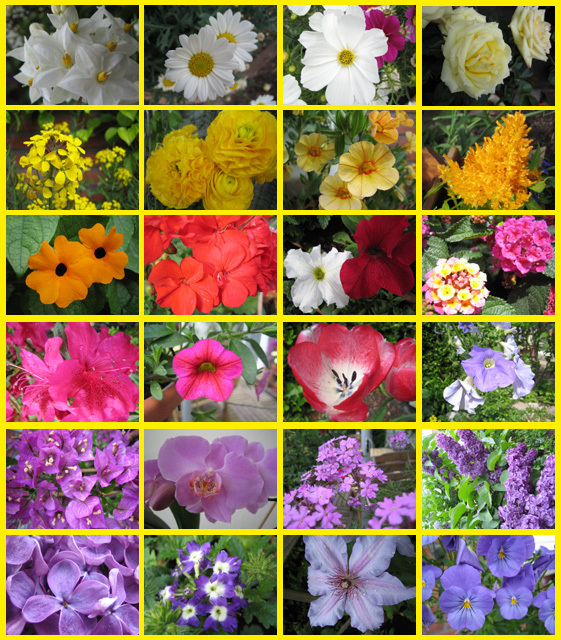 by Carola at 7:00 e.h.
maí 22, 2006 5:30 e.h.
What a fabulous flower collage! maí 22, 2006 5:45 e.h. I love the flower collage. Very cool indeed. I did receive your email and I'll be replying it to it today or tomorrow. Hope you are enjoying your summer in Germany!! maí 22, 2006 8:21 e.h.
maí 23, 2006 2:55 f.h. Du kommst nicht zufällig auch in Hamburg vorbei, wenn Du in Deutschland bist? Wäre toll, wenn wir uns mal zum Stricken treffen könnten! maí 23, 2006 11:17 f.h. Oh my goodness, those flowers are BEAUTIFUL! maí 23, 2006 2:57 e.h. I love Germany. I love summer. I love yarn. I'm so there. Have a great time! Tschuss! maí 23, 2006 11:43 e.h.
Those are some beautiful flowers! Germany always has the prettiest summer flowers, because it doesn't get as stinking hot as it does here in South Carolina. Looking forward to your contest, and have a wonderful vacation! maí 24, 2006 7:05 e.h.
júní 07, 2006 1:26 f.h. júní 09, 2006 3:53 f.h.